I have a confession: I cana��t really cook. Egg-based breakfast items, and banana bread apart, I have a long and meaningful relationship with my favourite takeout joint. So you can imagine the stress levels at our table when the On The Rocks team starts laying out ingredients and pots of simmering stock before us under chef Vijay Davida��s supervision. The whole presentation is part of the restauranta��s new menu that features more vegan options for guests while adding an East Asian flavour to the whole affair. Wea��re sampling the Hot Pot menu and apparently it involves cooking and I, at least, am terrified. Cue clenched teeth emoticon. We are left with an array of vegetables, meats, seasonings, smoked sesame oil and soya sauce and a pot on a hot rock bearing stock. Mine is chicken and my frienda��s is vegetable (she is taking one for the team and trying the vegan option). We chuck in our choice of ingredients (bok choy, shitake, lamb, with a some ginger and roasted garlic, and chili flakes for me). Just when we think wea��re done, David decides to step in and add some of the oil and soya sauce. Five minutes later, we nervously sip at our soups and discover both to be quite tasty in quite different ways. In time, we suspiciously demand a tasting of the stock, lest the game has been fixed from the start. It hasna��t. The process isna��t completely fool-proof a�� David has had to rescue some guests from their ginger-filled disasters a�� but you can try as many times as you need to end up with something edible. 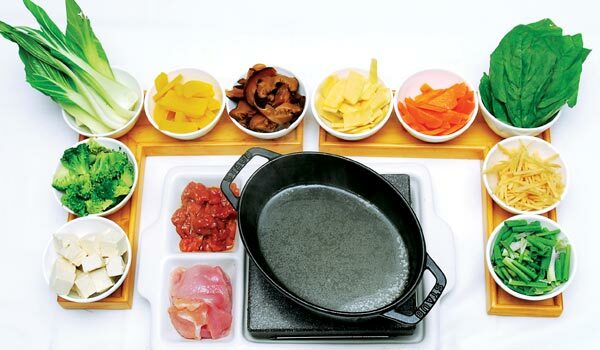 The hot pot comes with an appetiser of the day and a dessert of fruits and ice cream, apart from a choice of soba noodles or jasmine rice to mop up the dregs of your soup. Order a bottle of wine with it and you get a flat 20 per cent off. The East Asian influence extends to the cocktail menu that features some interesting sake-based cocktails. The old favourite Pomocino (with hand crushed pomegranate juice) and a lovely jasmine and coconut-milk rum-based concoction are must trys.